Another nice day with little travelling. If you'd have told me that I would really enjoy London birding when I first moved down here in 2003, I would have found that hard to believe. In fact, I'd go as far to say that the birding potential here in the capital is greater than that of Cheshire, where I grew up. Or at least that is how it now feels. Anyway, today started off very disappointingly. I headed up to the tip at Pitsea with Jamie P and Steve A - no trucks, not a single one and just a couple of hundred or so gulls. 'Big white', the leucistic Norwegian Great Black-backed Gull was there but little else, just a first-winter Yellow-legged Gull. 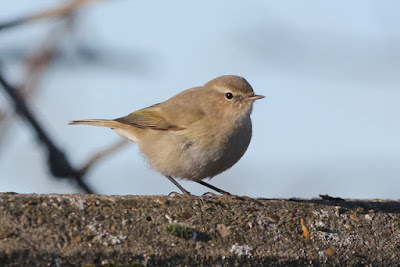 By mid morning Jamie P and I were back in 'the smoke' and checking out Beckton/Creekmouth for gulls. Loads about, but distant and nothing interesting. Common Sandpiper and Rock Pipit were present, but star of the show was an overwintering Siberian Chiffchaff in among at least fifteen or so of its commoner cousins. A real chameleon, with it at times looking tea-coloured (as in the photo below) but then in the shade looking ghostly and slightly 'Bonelli's Warbler-like' with the bright primaries contrasting with the pale underparts and brown mantle. Then with news that there was a Glaucous Gull at Walthamstow, we headed off north... although the bird flew south. 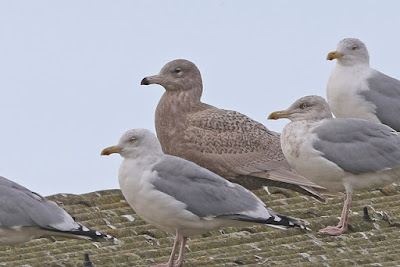 As this is Jamie's local area, he was quick to say it was worth checking Leyton Tip instead and as if by magic, on arrival, there was a big lump of a juvenile Glaucous Gull sitting on a London roof! Excellent, but views were a bit distant so I approached one of the workers - I'd whacked on my high vis vest, put on an estuarine accent and hey presto, Jamie and I were in and closer to it! Nearby at Walthamstowe, the Swallow - obviously my first in January - was whipping around the filter beds though was too distant for me to see it in any details (which I wanted to do, just to put my mind at rest for erythrogaster etc). 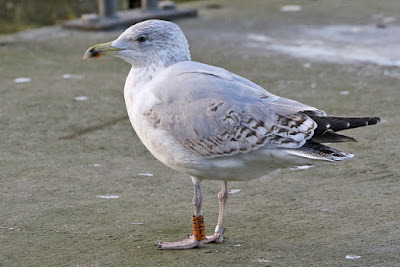 There was also a Black Redstart fly catching here (having seen one elsewhere earlier in the day) while back in Rotherhithe last thing, there were three ringed gulls near my flat - Polish and NTGG Black-headed Gulls and then a rather familiar Herring Gull that can't get enough of me! 3rd-winter Herring Gull M2LT Rotherhithe, London 28th January 2017 - ringed at Rainham on 2nd January 2015, then I saw it at Rotherhithe on 29th March 2015, 18th June 2015, 21st June 2015, 28th June 2015 and 7th July 2015, before it was seen at Beddington on 19th January 2016 and 16th February 2016, and then I last saw it at Pitsea on 3rd September 2016.